Please, take into consideration that this novel is copyright. However, I wish to share it with you. 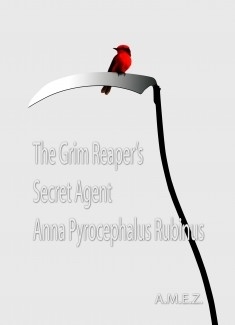 this novel is dedicated to those of you who may be interested in reading it or may be curious enough to find out more about this mysterious agent, Anna Pyrocephalus Rubinus, whose colleagues you will meet some day when your time to depart from this world comes. Please, forgive all the grammatical, composition and writing style or structural errors you may find in it. Imagine that you are among those human beings of this world who were chosen to have the opportunity to meet in person the Grim Reaper´s Secret Agent, who was chosen to fulfill a very important mission in your world. Be patient and tolerant when you read my novel, and I will be very grateful to you for the time you spent in reading it. For now, I say goodbye till the time comes to meet you in person. Best regards, A.P.R.